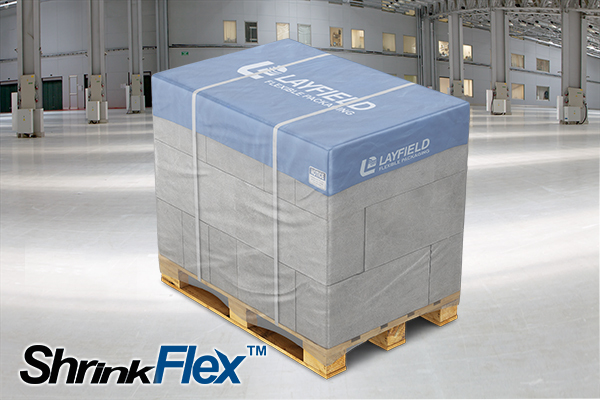 Layfield’s ShrinkFlexTM pallet hood film is a low-cost and effective method to palletise products. It has medium shrink force for a variety of applications. Unlike some other palletisation products, it doesn’t require high cost equipment to use. When you order ShrinkFlexTM pallet hood film from Layfield, you can rest easy knowing you’ve purchased from a reliable supplier with extensive experience manufacturing palletisation products. In addition to pallet hoodf film, we can also supply shrink wrap and stretch hooder film.